The infographic below (changing into a lawyers voice), will show within reasonable doubt, that in fact, social media should be a big part of your B2B marketing strategy. And furthermore, should be a high priority piece of your planning for every marketing campaign. Everything starts with your blog: If you want to share or start a conversation with social media, you need a story. Your story is your content. So focus on creating industry leading, original content on your blog, so people will link to you, subscribe to your RSS and come back. Other studies show that LinkedIn generates more B2B leads that all of the the other social networks. I guess you have to test it with your target market to see what works best for you. But one thing I will say in LinkedIn’s favor is that it’s targeting/segmentation abilities are second to none and allow you to really hone in on your target market. The jury says: Don’t forget to use the tweetable stats and quotes at the bottom of the page so you can show off your new social B2B marketing education. 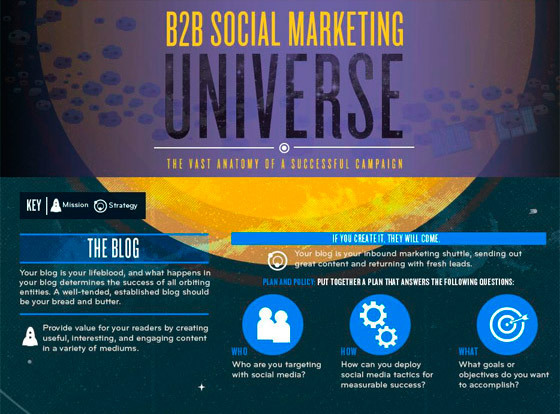 Along with the 3 bonus blog posts on the subject of B2B social media marketing.